Heat a griddle or non-stick skillet over medium heat. 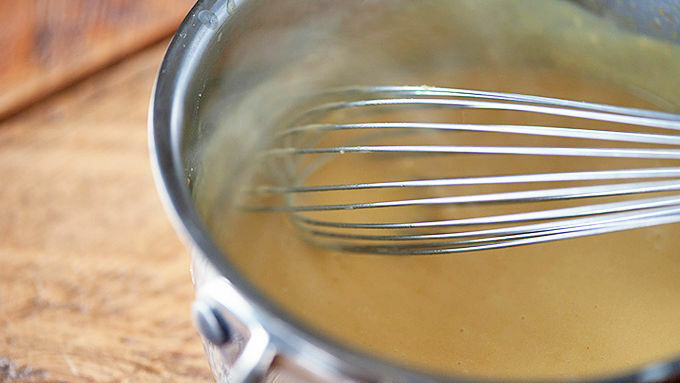 Whisk together the Bisquick™, milk, and egg until combined, but still slightly lumpy. Pour 1/4-cup batter onto the hot griddle and cook until bubbles form and pop. Flip and continue cooking until cooked through. Repeat with remaining pancake batter to make 12 pancakes. Meanwhile, in another large skillet, fry the eggs until cooked to your liking. Remove from the heat and set aside. Add the Canadian bacon to the hot skillet and heat through, letting the outsides get a little browned. Set aside. Prepare the hollandaise sauce according to the directions on the packet. 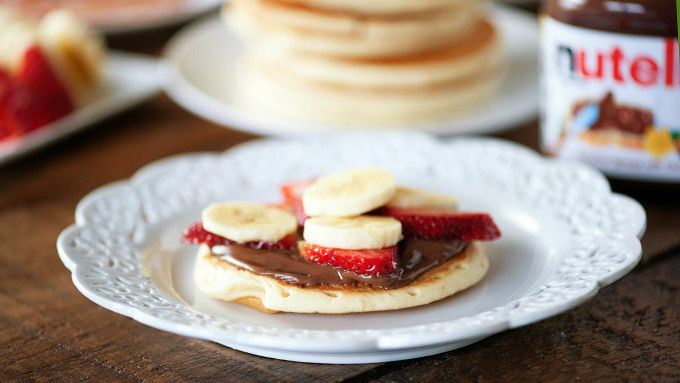 To serve the sweet sandwiches, spread one pancake with Nutella, top with sliced strawberries and bananas, and top with a second pancake to form a sandwich. 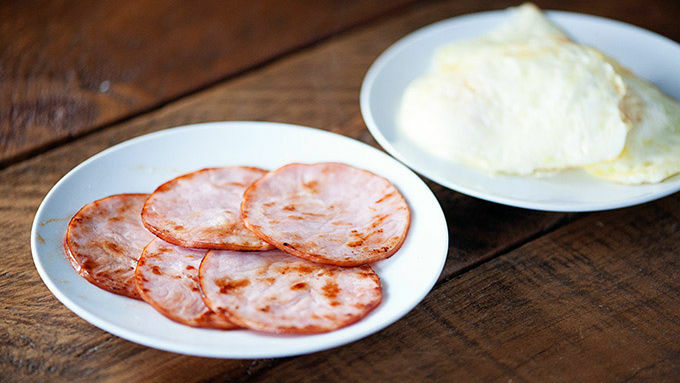 To serve the savory pancakes, place two slices of Canadian bacon and one egg on one pancake. Top with a second pancake. Serve alongside the hollandaise sauce for dipping. Recipe makes 3 savory and 3 sweet pancake sandwiches. Adjust the filling as needed to make extra sweet or savory sandwiches. As the recipe is written, you’ll make 3 of each. Sweet or savory filled pancake sandwiches are great for a grab-and-go breakfast. I’m a bit of a pancake freak, if you don't know. I don’t tend to eat them for breakfast that often, but I love them for dessert. Weird? Maybe. I don’t care though! 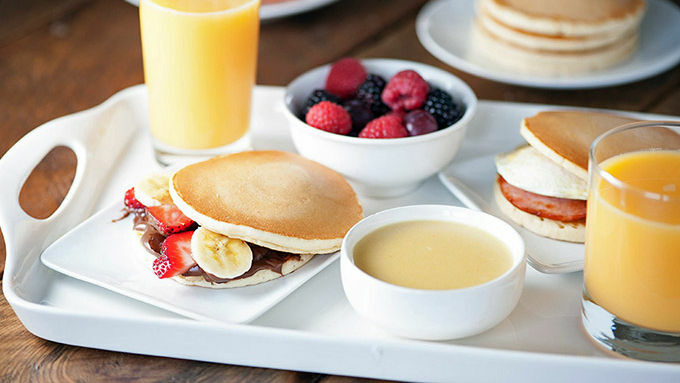 Sometimes, however, you just really have to have pancakes for breakfast or brunch! That’s when I like to get creative. 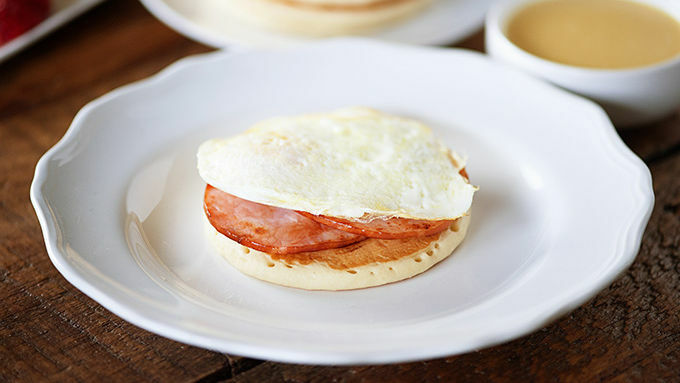 Take, for example, these pancake breakfast sandwiches. Yeah, buddy. These are perfect for the next time you have guests over for brunch. 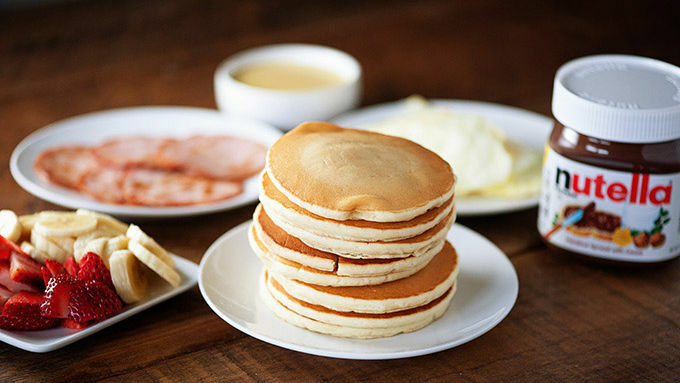 Orrrr, the next time you’re just really craving pancakes. Whatevs. I thought it would be fun to make two types of sandwiches with a big stack of flapjacks. One sweet, one savory! Serve it all up with some OJ and a side of fruit salad, and you’ll be a brunch rock star!